Leveling the field: Do we have fairness in Canada yet? Why is equal coverage throughout the provinces and territories so important? What's the difference between a SEB and a generic medication? What can you do to help level the field in Canada? Many different groups face discrimination for a variety of reasons such as age, gender, race, sexual orientation, religion, and disability status. 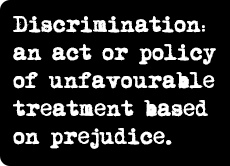 Most people view these kinds of discrimination as unfair and unethical. People living with arthritis face their own form of discrimination. People living with certain diseases often face unfair and unequal treatment based on the disease they have. Arthritis is one of those diseases. Specifically, not all Canadians have the same access to biologic response modifier medications (“biologics”), which are the gold standard for treating rheumatoid arthritis (RA). How many biologics are covered? How soon do people have access to them after onset of RA symptoms? How many hoops do they have to jump through or can they be reimbursed for the medications? All of these critical factors depend on the province or territory in which they live. People living with RA are at the whim of their provincial or territorial government’s decision to make these medications easily available to those who need them most. Biologics represent a major breakthrough in RA management and are especially effective in treating the disease within six weeks after it first appears. They are also effective for those who respond poorly to traditional disease modifying anti-rheumatic drugs (DMARDs), including methotrexate. Many people have experienced complete clinical control of RA and an end to progressive joint damage while taking biologics. However, no two people respond to a biologic therapy in the same way. Each individual’s disease is different and requires a unique treatment plan. The clinician and patient must weigh the potential risks and benefits that go with each biologic. For that reason, it is critical that clinicians have access to different biologics, so they may supply the best treatment plan to their patients. 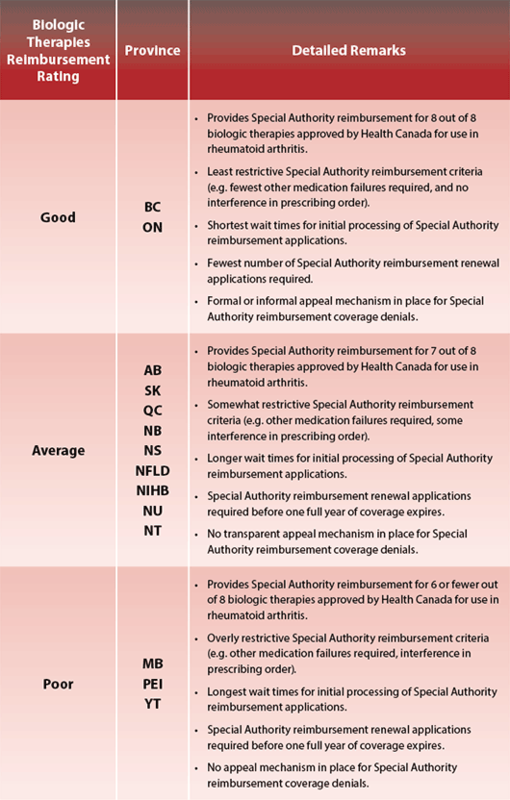 Unfortunately, biologic reimbursement coverage varies among the provinces and territories. Rheumatoid arthritis is a debilitating autoimmune disease that progressively erodes the synovial joints and the surrounding tissues. If left untreated, it causes irreversible joint damage, chronic pain, and loss of joint function, all of which lead to lowered quality of life and reduced life expectancy. Joint damage begins within six weeks of onset of RA symptoms, therefore it is vital that all Canadians have quick access to these medications. Though reimbursement for a biologic is approved in those patients with RA where treatment criteria have been met, the process for meeting them is not equal across all the provinces and territories. It is a form of discrimination, in which some people, depending on where they live in Canada, may lose out on the benefits that other Canadians may have. To alert government decision-makers to the fact that access to biologics is unequal across Canada and to the limited ability of patients and physicians to choose the most appropriate biologic to treat RA. That paper was called Leveling the Field in Canada: Moving Toward Reimbursement Equality in Biologic Therapy for Canadians with Rheumatoid Arthritis. With the same objectives, a second edition of that paper was released this month. In the last two years, some jurisdictions have made it easier for patients to access biologics, but challenges remain. Unequal access across the country remains an issue, and so do delays and barriers within the public plans. Also, public drug plan transparency remains a concern. For example, no public drug plans publish information regarding how quickly the RA biologics can be accessed. This information should be available to all patients and clinicians, with regular and timely updates. The new version of “Leveling the Field” also draws attention to the issues surrounding the emergence of subsequent entry biologics (SEBs) for the treatment of RA. As patents expire for brand name biologics (like Enbrel®, Remicade® and Humira®), SEBs are being developed. They are meant to be similar enough to the reference product that there is no clinically meaningful difference between them when it comes to safety, purity and effectiveness. However, biologics are very complex and not easily copied and the problem is deciding when a copy is good enough to be used in place of the original. Will the drug be as effective as the reference drug? Will it be as safe as the reference drug, both in the short and long term? Will it be as well tolerated as the reference drug? Will the rates of infusion and/or injection site reactions be similar? If a SEB is substituted for a prescribed drug, will this have any adverse impact? How will the pricing of SEB products affect the overall price of the RA biologic class? Where will the therapy be administered and will they require similar co-medications to the reference drug? That there be a national approved brand name biologic to which the SEB in question can be compared for similarity. That physicians and patients should remain free to select the most appropriate biological therapy based on the patients’ needs and its history of safe use and clinical response. That decisions to substitute one similar product with another should only be made at a physician’s discretion. That each SEB product has a unique and distinguishable name, as well as a distinct name under the International Nonproprietary Names (INN) Program of the World Health Organization. That SEBs not be given preferential listing on provincial formularies if it is at the expense of patient safety, proven product efficacy, and physician-patient choice. That monitoring of SEBs must conform to the same rigorous standards as those used for brand name biologics. With each of the public drug plans ultimately deciding independently whether SEBs will be interchanged with reference biologics, it will be important to ensure that biologics for RA are equally and appropriately funded. To read the Leveling the Field paper, please click here. The scientific content of this paper has previously been published in Clinical Rheumatology (2010) 29:233–239, Clinical Rheumatology (2012) 31:1289–1292 and is incorporated here with permission. Biologics are engineered to target and block specific disease pathways responsible for the inflammation and joint destruction seen in rheumatoid arthritis. They are complex molecules derived from unique living organisms and cell lines. They are made with the aid of DNA recombination technology and secreted by cells, bacteria or plants, which have incorporated the appropriate genes. The medications are then harvested from the secretions. Making them is a complicated process. The molecules themselves are composed of a large number of molecular components and are of a large molecular weight, which is why they are administered by injection or intravenously (directly into a vein). Small differences in the production of biologics can yield vastly different products with unique effectiveness and safety implications. There are no studies that have compared biologics to one another. However, statistical data has shown that no one biologic is superior to the other. This may be because RA behaves differently in every patient, and therefore each patient has a different response to each biologic. What’s the difference between a SEB and a generic medication? The generic forms of a reference medication are usually marketed after the patent of a branded agent has expired. A generic contains an active component, normally a small molecule, that looks and acts the same as the reference one, where the only difference between the ingredients in each is possibly the binding agent (e.g. gum arabic, syrup). Marketing the generic form requires only a shortened process, since it is not a new chemical. A subsequent entry biologic (SEB) is a term used to describe a biologic product that is similar to a brand name biologic that has gone off patent. Other terms used to describe SEBs include “biosimilar”, “similar biological medicinal product”, or “follow-on protein products”. They are not “equivalent” to well-researched brand name biologics. A SEB does not need to be identical to the original biologic, but the protein’s amino acid sequence must be. It is expected that SEB products will produce the same clinical result in any given patient as the reference drug. Biologics are an important part of an RA treatment strategy. As Canadians, we ALL deserve the right to be healthy and lead our lives as fully as we can, in spite of our disease. Unfortunately, each one of us who lives with rheumatoid arthritis, is at the whim of our provincial or territorial health ministry’s choice whether to provide us with the same access to the same biologics that other Canadians have. But we elected the politicians that decide our fates and so they will listen to us, if our voices are loud enough. For more advocacy options, go to jointhealth.org/takingaction. Over the past 12 months, ACE received unrestricted grants-in-aid from: Abbott Laboratories Ltd., Amgen Canada, Arthritis Research Centre of Canada, Canadian Institutes of Health Research, GlaxoSmithKline, Hoffman-La Roche Canada Ltd., Janssen Inc., Novartis Canada, Pfizer Canada, Sanofi-aventis Canada Inc., Takeda Canada, Inc., and UCB Canada Inc. ACE also receives unsolicited donations from its community members (people with arthritis) across Canada. Click to download a printable PDF of the Leveling the Field in Canada 2012 booklet.